In the years at the beginning of the 13th century the Byzantine Empire, centered at Constantinople, was roiled by still another of its recurring dynastic struggles. Emperor Isaac II Angelus, a somewhat dotty ruler, had been deposed and imprisoned by his brother, who ruled as Alexius III. Dotty though he might be, Isaac II had nonetheless managed to arrange the marriage of his daughter to Philip, King of the German state of Swabia. Following the coup d'etat at Constantinople, Isaac II's son, also named Alexius, fled to the sanctuary of his German brother-in-law. There he and King Philip devised a fateful plan which they submitted formally to the wayward forces of the Fourth Crusade that were wintering at Zara. The proposal had two major elements. If the Crusaders would transport young Alexius to Constantinople, depose his usurping uncle, and install young Alexius as emperor, the new emperor would use his imperial powers to finance the Crusade in its conquest of Egypt. In addition, he would return the Eastern Orthodox Church at Constantinople to the authority of the Pope at Rome. The Crusaders--perhaps motivated as well by an unspoken third incentive, the possibility of plunder--agreed with only token defections. The mighty fleet arrived at Constantinople in June 1203, anchored at the Asian shore across the Bosporus from the Byzantine capital, and demanded that young Alexius be placed on the throne immediately. Thereafter, the Crusaders set about a swift and efficient plan of action. On July 5 they crossed the Bosporus and landed at Galata, the shore separated from Constantinople by the broad river mouth known as the Golden Horn. Their military objective at Galata was to capture the fortification that protected one end of a tremendous iron chain that stretched across the Golden Horn and secured the flank of the city from naval attack. The mission was accomplished within a day and the chain was lowered. The awaiting Crusader galleys swept in and destroyed the remnants of the Byzantine fleet anchored there. General attack on Constantinople followed on July 17. The Crusaders from France, attacking the city by land from the west, were halted and driven back. 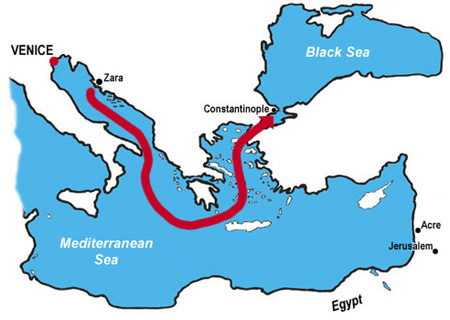 The Venetians attacked simultaneously by ship along the coast of the Golden Horn. They engaged tentatively at first, until suddenly one galley broke forward and drove its prow firmly and irrevocably onto the shore. Standing fully-armed at its prow was the ancient and blind Doge of Venice, Enrico Dandolo--a man for whom only victory was acceptable. None of the Venetian galleys dared hang back in the face of such daring and audacity. Soon the tide of battle swung firmly to the Venetians, who captured more than 25 of the defensive towers of the city. As night fell, Emperor Alexius III fled the city--pausing only to secure a reported five tons of gold and a bag of jewels. The Byzantines immediately restored Isaac II to the throne. By July 1 young Alexius, now Alexius IV, was installed as co-Emperor and his earlier promises for compensating the Crusader force were renewed. Their mission seemingly accomplished, the Crusaders returned to their encampment in Galata, across the Golden Horn, to await payment. Did anyone, except perhaps Doge Enrico Dandolo, perceive that the the following year would bring the sack of Constantinople and dismemberment of the Byzantine Empire?